Another gem from the people at STABMAG.COM. 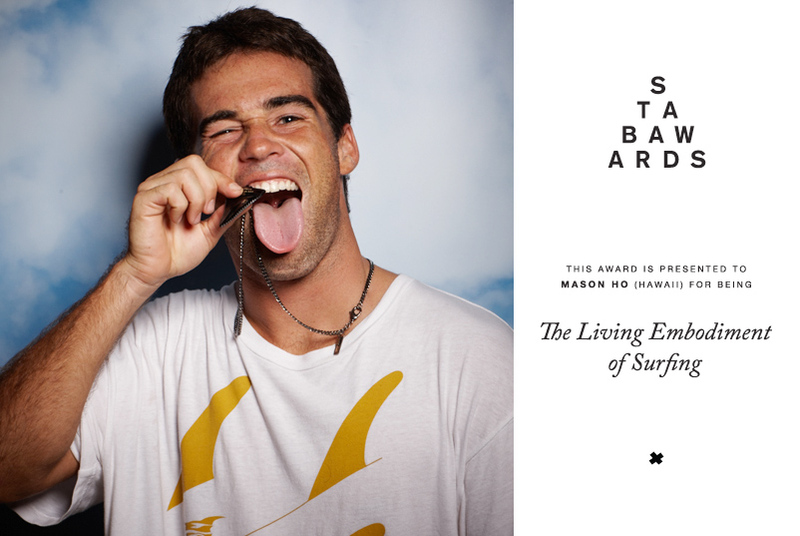 This time with some kind words and even an award for our very own Mason Ho. Read the accolades below. In the oddly-monopolised realm of surf awards, the ill-fitting collars and awkward speeches and strict nature of it all dips its toes in cringe. The Stab Awards are our take, our view, our pick of the people in our world who we believe made the right noise last year. Scroll the gallery below for all our winners. Oh, and the trophies themselves are the teeth of naturally deceased sharks, repurposed in black and yellow (echo) to be worn around the necks of sickeningly good surfers. Mason Ho is the one surfer whose game, from his style to his mood to the vibrato of his vocal chords, fits… exactly… what surfing is. A little bit acid, a little bit crazy, a little wise, a little pretend dumb, but all wrapped up in the banana leaf of good times.